John Bauer is an established ceramisist who lives and works in Cape Town. His work has been exhibited world-wide, and collected by two museums before he was thirty. 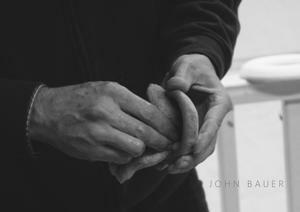 He is globally recognised for his unusual, cutting edge developments in Porcelain production. Using Sung Dynasty techniques, the images on his work rise above the surface of the clay. They are not negative impressions, but positive ‘expressions’ from the clay’s surface. He perfectly reproduces in porcelain the trappings of a past age, where skill and craftsmanship were an artist’s primary concern. By appropriating rare coins, carvings, lace and organic substances he not only references the technologies of the past but archives them for the future. John Bauer pushes the limits of what is technically possible in ceramics. A sentimentalist, he salvages antique crochet cloth, linens and lace and makes these materials immortal by recreating them, stitch by stitch, in porcelain. He is able to enlarge them to gigantic proportions or offers them in an extreme diminutive form. There is always a surprise factor in his work. It is full of light and translucency. Love is a central theme in Bauer’s work. He sometimes uses the inspiration of netsuke, old coins, flowers, found objects and dolls to embellish his work. His signature bowls carry his artwork of mythical creatures and angels whispering words of wisdom and love.